If you and your student believe they have the ability and the desire to receive a scholarship for college athletic competition, you will want to start working toward that goal by the time they reach high school. There are a number of things you MUST accomplish at the appropriate times in order to secure the best possible offers for your student. While college sports in many ways is a business, for your student a very important component remains their education. The NCAA actually helps with this by requiring a certain number and type of courses, with minimum required scores, be accomplished by the student in high school. While the athletic scholarship process is often referred to as “being recruited”, it is not by any means a process you can just sit back and watch develop. The amount of effort you put into being recruited (contacting coaches, updating your statistics, etc.) will be directly reflected in the number and quality of offers you receive. Your best bet to become familiar with the process of receiving a college athletic scholarship is to find a reputable book or guide to help you understand the process. The Sports Scholarships Insider’s Guide written by Dion Wheeler is recommended. 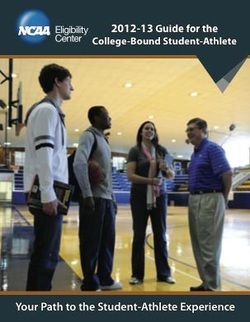 Another place to start (and for sure not to miss) is the NCAA Guide for the College-Bound Student-Athlete, which can be downloaded at www.ncaaeligibilitycenter.org. This guide will detail for you things such as the required courses and scores you must earn to be deemed “academically eligible” for NCAA competition, the rules of when and how you may interact with college coaches (which is different for Division I, II, and III schools), and guidelines on when to submit your transcripts to the NCAA to be declared eligible. The first steps you need to take are to review the high school course requirements found in the NCAA Guide for the College-Bound Student-Athlete. Depending upon what division of college program you end up being recruited by, there may be strict requirements for specific courses that you must take in high school, grades you must achieve in those courses, and corresponding scores you must achieve on the SAT or ACT college entrance exams. Without planning your high school course selection to meet these guidelines and achieving academic success in your classes, you might lock yourself out of consideration by many college programs. While over 500,000 athletes participate in sports in the nation’s college programs, less than 1% (4,000) of those students get a Division I, full-ride financial aid grant. In fact, 80% of all college athletic opportunities are outside Division I. Division I schools are the largest and most prestigious programs. They are the most competitive, and require the most significant academic achievement. There are roughly 336 D-I schools in the country, with 21 in Texas. Division II schools require a slightly less rigorous level of academic success in order to be eligible. There are roughly 289 D-II schools in the country, with 14 in Texas. Division III schools do not have any academic eligibility requirements attached, however these schools are required by NCAA regulation to tell you that they “do not offer any athletic scholarships”. The truth is that D-III schools have scholarships to offer; however they cannot (theoretically at least) be based upon athletic ability. So if you are a tremendous athlete and are recruited by a Division III school, expect them to offer you an academic or other titled scholarship, not an athletic scholarship. Because D-III schools cannot offer “athletic scholarships”, they are exempt from NCAA academic regulation. If you find yourself having struggled academically and ineligible for D-I or D-II schools, the D-III programs are where you will want to find a school willing to take a chance that you will be more successful in college. Because D-III financial aid offers cannot be discussed by the coaches (only the financial aid office), it is somewhat more complicated for you. While it is important at all divisions to have ALL scholarship terms included in the tender offer that you will sign, you will want to be even more careful in D-III schools where the money and the offer to play are coming from separate departments. There are roughly 448 D-III colleges, with 16 in Texas. You can find a list of all schools by division at www.ncaa.org and click on “About the NCAA”. Some schools operate under NAIA standards. These colleges generally will not offer any “full ride” scholarships. They also are only limited in the number of scholarships per sport by the policies of the individual institution. To be eligible in NAIA you must meet 2 of the following 3 standards: 1) graduate in the top half of your class; 2) score a minimum of 18 on the ACT or 860 on the SAT; 3) achieve a high-school GPA of 2.0 on a 4.0 scale. Once admitted, there are minimum standards you must maintain to continue to be eligible. There is no registration or initial eligibility center requirements for NAIA, and you may have a campus tryout for a team and not be penalized. OK, now that you understand the NCAA academic eligibility rules and have set your classes accordingly, what’s next? Do well in those classes, work hard in practice, and strive to improve every time you step on the court or the field to practice or play. Every bit of work you put in is a down payment on your future. You will want to work with your parents to set up a recruiting site to showcase your talent and your accomplishments. There are many such sites out there, one of the best is found at www.berecruited.com . For FREE you can set up a basic site that college coaches can search and find you. For an additional fee you can receive additional benefits to be more prominently displayed on the site, and to know exactly who has looked at your information. As far as gathering statistics, check with your coaches to see if they already have stats they can share with you, or parents may need to keep them during games/matches. Many sports have software that works with a handheld device (I-phones, Palm Pilot, I-Pad, etc.) that will allow you to track stats. If you have any questions, simply search the internet or check with your sport’s head coach for more information. At the beginning of your Junior year, you will need to submit the required documents to the NCAA so they may certify your eligibility. You must request a copy of your transcript be sent from the school directly to the NCAA eligibility center, along with completing a questionnaire that will be used to certify your initial eligibility. Once you are initially certified, you will have a few more steps to complete. When you take the SAT or ACT exams, be sure to enter the NCAA Eligibility Center’s code of 9999 as one of the places you want your test scores to be sent. You will also need to request a final transcript from your high school (after final graduation) be sent to the NCAA so that they may complete your final certification to participate. Registration and all other details regarding eligibility certification can be found at www.ncaaeligibilitycenter.org . One final note regarding eligibility certification – if you are fortunate enough to by the end of your Junior year already earned a 1000 SAT score (composite of reading & math), an 86 ACT composite score, and a 3.0 GPA in the NCAA core curriculum courses, you may contact the NCAA Initial Eligibility Center and ask for “Early Certification”. If you meet this goal, you raise your value as a recruit because coaches don’t have to worry about whether you will meet academic requirements to be eligible. Now you have taken care of your classes, your grades, and your eligibility certification. You should have a profile set up (on www.BeRecruited.com or a similar site), and you should be working as hard as possible to develop your skills to a higher level and increase your dedication and commitment to your sport. For a college to believe in you enough to offer one of their scholarships (of only a few each year depending upon the sport) they will need to see that you are serious about being committed as a successful part of their program. While some schools will simply “find” you – through BeRecruited or through coaches or tournaments you may play, you MUST be proactive if you want to assure that a certain school or group of schools recognizes you. You should create a personal profile to introduce yourself to coaches at schools you are interested in. Your profile represents your scholarship resume. You will find examples of athlete profiles online or in a guidebook like the one recommended above. Most importantly, make sure your profile honestly represents your accomplishments and activities. This is not the place to embellish or oversell and have coaches learn you are less than honest. You will have the chance to “sell” yourself in the cover letter you should send with your profile to each coach. DO include stats, honors, opportunities, and of course contact information for yourself, your parents and coaches. With a profile in hand, you will want to create a cover letter for EACH INDIVIDUAL SCHOOL you wish to contact. You will want each letter to appear personal – do not send a generic letter without the name of each individual coach and some facts that let the coach know you have actually looked at the details of their program. Recognize their past accomplishments or note your desire to compete in their conference, something that lets the coach know you have a true personal interest in their program. This is where, within reason, you want to sell yourself as the committed hard working athlete they don’t dare pass up. The letter should be no longer than 1 page. Finally, you want to have video evidence of your skills. Depending upon your sport, and your position, you want to show your skills. You may want to demonstrate your ability in staged drills for a portion of this, however coaches will want to see some unedited game footage that demonstrates your regular level of play. These type videos can be produced on your own, or there are many companies who specialize in creating professionally edited highlight videos. You may also get an idea of what to include by checking out some other profiles in your sport on www.berecruited.com . If you have reached this point and successfully accomplished everything we have already talked about, you only have a few more steps. One of the most important will be to answer any requests for information (or requests that you complete a college questionnaire) in a timely manner. Coaches love to see athletes that take their future seriously, and a great way to showcase your responsibility and commitment is to quickly and effectively answer any and all requests for information. When you start to see results, and coaches begin to contact you (via letter, phone calls, or visits) you will want to make a note card to remind you of the allowable contacts, and dates for those contacts, in your individual sport. These details are found on www.ncaaeligbilitycenter.com and in any publication you might rely on. Violating the rules of contact, and/or accepting any benefit not allowed from a coach or recruiter could jeopardize your entire opportunity to receive an athletic scholarship – make sure you stay within the allowable boundaries. There are many other pieces of advice, steps that can be added, and experiences that you might read about that may help you to be successful in your search for an athletic scholarship. If you find a great resource, please let us know here at the Spartan Athletic Club and we will add it to this page. Good luck in your future endeavors, and as always – Go Spartans!! !